Paul bets Jim $500.00 that Shane will win the boxing match with Jim. Helen is horrified with Jim and Paul gambling on who will win the fight and reminds them that this is the season of goodwill. Jim points out that he didn't make an issue out of the fight and that Paul is a habit of being disloyal to the family. Scott feels that they should support Mike. Jim goes off it a huff saying he needs some fresh air! Jim is washing the car as Dan wanders over and tells him that he shouldn't do that. Jim snaps back that he doesn't need his advice to wash his car. Dan replies “Typical pig-headed Robinson attitude…just like your Dad thick as a brick” then points out that a Ramsay would always wind-up his car window before he washed the car. Dan then starts stirring it with Jim about the boxing match saying that Jim is a hopeless trainer and that they actually thought Jim was in training himself to help Mike throw in the towel! Jim replies that he now knows where his sons get it from, they are all talk and no action as well. Dan gets irritated and replies that if Jim wants action then he better take out insurance he knows how to handle himself…he was a contender. Jim smirks about him being “Canvas back Ramsay” and Dan bites back that he never had any trouble handling the Robinson's…he then insults Jim by saying that the only one who had a decent left hook was Jim's grandmother the rest were easy meat! Jim gets annoyed and picks up the soapy sponge and starts to walk towards Dan gesturing it in his face as he walks backwards…as Jim does he tells Dan that the Ramsay family just like trouble for breakfast…lunch and dinner…That thick headed grandson of yours thinks he can solve all his problems with his fists and now you want to turn it into world war three. As they reach the Ramsay driveway Madge comes rushing down the drive and tells Jim off for picking on a defenceless old man. Dan puts on an act and grabs his chest complaining of having a turn. They are joined by Clive and Mike. 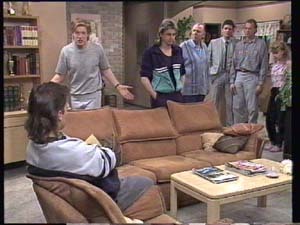 Dan then accuses Jim of bringing all his mates in to attack him….a typical Robinson trick. Clive tries to calm the situation by saying that they had enough trouble this morning. Madge is not happy with the situation at all and says she is going off to see Helen. Paul is on the phone as Helen comes in telling Madge that Paul is laying bets on the fight. Paul tells Madge that he is backing Shane, she sarcastically says that it is typical him backing the winning horse. Scott hobbles into the kitchen and tells her not to count on it. Helen tells him to stop it and tells them that she and Madge are going to put a stop to this ridiculous fight right here. Madge then asks Helen if she will speak to Jim, but Helen is dismayed and says apart from the bet he is having with Paul she feels that Jim is being reasonable. Madge points out that she didn't hear him outside talking to Dan. Helen reasons that Dan is the one who has been stirring it all up. The men in her family certainly like to throw their weight around. Madge takes a deep breath and tells Helen that she will not listen to her saying things against her family. Helen says that you know what the Ramsay is like, Max and Tom and Dan is even worse. Madge won't hear of it and points out she is a Ramsay. She came over here for a bit of commonsense but she thinks Helen is as biased as the rest of the family. She feels that Helen shouldn't be throwing stones while she lived in a glasshouse. Helen is dismayed and wants to know what she means. Madge points out all the problems Helen has had with Paul, Scott, Lucy, Laura and Nicky. She points out that it is very clear to her that it isn't the Ramsey's who have problems around here! Helen is shocked and tells her should we start discussing Charlene. Madge angrily says don't you dare start discussing my daughter. Helen goes to apologise but it is too late Madge walks out of the back door in a huff. Dan still stirring it, is pointing at Mike who is talking to Clive. He tells Shane to look at Mike …he has a glass jaw for sure. Mike tells Dan to have a good look at Shane he is going to look a lot different after the fight. Charlene thinks that the whole thing has gone too far. Dan just dismisses her as being just like her mother…peace, harmony, sweetness and light. Madge comes storming in the house slamming the front door behind her. Madge tells them that if the Robinson wants war they have got it. She has just been stabbed in the back by her so called best friend. She points at Charlene and tells her that she can stay away from Scott as well and storms off into the kitchen. Des and Jim come into the living door via the backdoor and Madge demands to know what they are doing there. Clive explains it is a peace conference. Madge angrily tells him that she is giving them five minutes then she will physically throw them out. Dan starts arguing with Jim saying if your mother-in-law has been abusing …He is interrupted by Clive raising his voice and shouting at them that he has called a peace conference….then getting control of his emotions he lowers his voice and says I am going to have a peace conference. He explains that it is confession time, the whole boxing idea was his but he never intended for it actually to take place. That Jim, Des and himself had figured that the training would knock some of the aggro out of them. That because they were sensible intelligent guys that they would realise that violence solves nothing. Unless they want to put evolution back two million years don't they think it is true? …Shane comes off the phone and informs everyone that the gym is booked for lunchtime and that Mike better be there. Mike replies he will, Clive says that it really isn't necessary. Shane tells that it is a matter now of honour. Clive argues that they are all getting worked up over nothing, do you think you can win a girl like this, it is caveman stuff, just shake hands and let Jane decide who she wants to go out with. Dan sneers at him “Peace with honour that was what Neville Chamberlain said just before Hitler punched him up the throat” Dan points at Clive and continues that if he is the referee then he doesn't like it. Clive admits defeat and says that it will be a fair fight. Charlene says that Clive is right, Jane hates all this fighting. Shane scoffs and replies that all this isn't just about Jane anymore it is about family. Dan is massaging Shane in on the kitchen table; while Madge complains that couldn't they have done that somewhere else. Dan tells her that there isn't anywhere else they can do it and complains about women. Madge says that she is off to work and Charlene reminds her who she works for. Madge says it will be Ok as Paul is backing Shane. Dan rolls his eyes and says typical a fifth columnist. Madge asks Charlene to get some washing off the line and then leaves for work. When Charlene goes to do as she has been asked Dan stops her and questions her about slipping next door. Charlene tells him she wasn't going to see Scott but if he thinks that this Macho rubbish is going to split her and Scott up then he can think again. There is a knock on the door and Jane arrives, she has come to thank Shane for calling off the fight. Shane tells her that he only said he would think about it. Shane tells her it is too late. Jane replies that having to guys smash each other up might appeal to some girls but not to her. If he doesn't call off the fight then she wants nothing to do with him and she will make that perfectly clear to Mike as well. After Jane has left Charlene says he is doing real well, he has lost his girl and most of his friends. Des and Daphne are giving Mike boxing advice and instructions on different moves he could use as Jim wraps his hands to go into his boxing gloves. 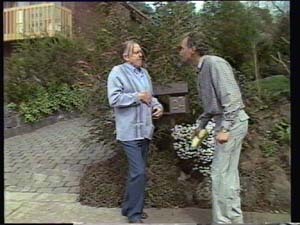 Mike asks Jim to get them off his back and Daphne and Mike wander over to talk to Clive. Clive is sitting on a bike reading the rule book. 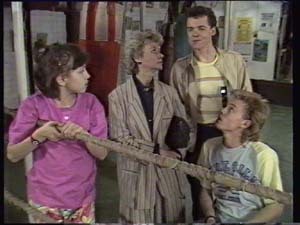 Daphne tells him if there is one mark on Mike…Clive interrupts and says that he intends to stop the match the first chance he gets. But the rule book is not much help it keeps talking about physical damage. Clive comes over and tells them that the fight will start in two minutes and Dan tells him that he will be keeping his eye on him. Dan wants to know what all the Christmas rubbish is in the corner of the room. Clive explains it is for the Christmas children's party later. What does he expect shrunken heads! 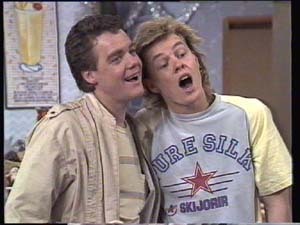 Both Mike and Shane are fitted with boxing head gear and the rest of the neighbours arrive to watch. There are cheers and boos from the various supporters as the contenders enter the ring. Each camp of supporters offer advice to their contender. This results in a slinging match between the two camps of supporters. Clive gets into the ring and calls hush, he says “I guess you are wondering why I called you here today; I guess a sense of humour is out of the question. Looking around I see a lot of aggression in people who used to be good neighbours” Dan tells him to get on with it. Clive continues “As this is the last time any of you will speak to one another I would like to remind you that it is nearly Christmas and I would like to wish you all the best and I would like to ask you in the name of good will to call it quits” There is a awkward silence then Jim says “Let's get it over with” Clive admits defeat and calls Mike and Shane into the centre of the ring. 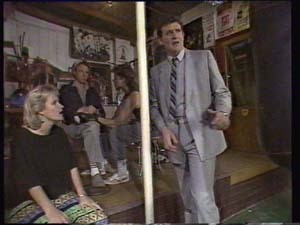 Clive gives Susan the bell and tells her to time the rounds and give Mike and Shane instructions on their conduct in the ring. Mike and Shane go to their respective corners and receive last minute instructions from their trainers. Clive says that Susan will ring the bell at the start and end of each round. Susan panics and rings the bell immediately. Clive steps forward to tell her to stop but it is too late Mike and Shane come out of their corners and take a punch at each other. In the confusion Clive steps forward at just the wrong time and the punch first from Mike hits him on the left side only to be followed a few seconds later by one from Shane on the right side. Clive hits the floor out for the count…. ….The Neighbours all gather around Clive to try to revive him while he mumbles “Ho…Ho…Ho! Very, Very strange dream sequence. 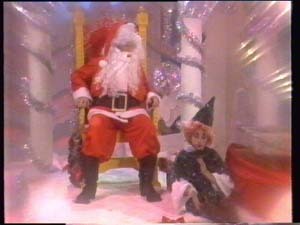 A very disorientated Santa (Clive) is sitting in his grotto and at his feet an Elf (Lucy) tells him that they are waiting for their presents. Santa umms and ahhs before the Elf reminds him that he has to Ho Ho Ho. The tin soldier (Scott) salutes and approaches and says he wants a kiss from the CWD. Santa wants to know what CWD stands for and the tin soldier explains Clock Work Doll (Charlene) The CDW is being wound up by a clown (Dan) and the tin soldier goes over to her and kisses her. She tells him to mind himself or she will chip his paint work. 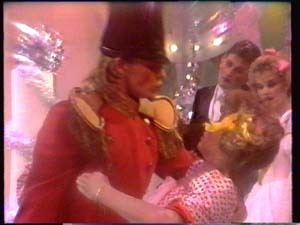 Little Bo-Peep (Madge) says that she doesn't think that the tin solider should be kissing the clock work doll and starts to use her sheep staff to pull them apart but is stopped by the Wizard (Jim) sprinkling magic dust on her. Tweedledum (Shane) and Tweedledee (Mike) try to get the fairy (Jane) down from the top of the Christmas tree. The Clown eggs on Tweedledum to bash Tweedledee. 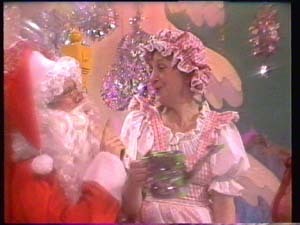 After a nod from Santa the fairy godmother (Helen) taps Tweedledum, Tweedledee and the clown on the head a freezes them solid. Santa says to the elf that giving away presents isn't so easy. He then asks Mary Mary Quite Contrary (Mrs Mangel) what can I do for you. Mary Mary skips over to him and sits on his lap and tells him that she isn't going to tell him. Santa says “Now don't be contrary Mary isn't there someone who she would like me to find”. Mary Mary waves her watering can around and says that he can't find him no one can he had has disappeared and skips off. The Bride Doll (Daphne) and the Groom Doll (Des) rush over to either side of Santa and the Bride Doll says that they want their baby to be happy and healthy. The Groom asks if it could also be cute and cuddly. Santa is sure that they will get their wish. They kiss Santa one of each side of his cheeks and then each other. The Dolls then tell Santa that it is his turn. The Elf explains that everyone chipped in for a present for him and asks the Fairy Godmother to “Let it rip” The Fairy Godmother steps forward waves her wand and there is a flash of smoke but nothing happens except a lot of coughing by the Fairy Godmother. She tries again…a wave of the wand lot's more smoke and Mary Christmas (Susan) carrying baby Christmas (Sam) appears. They all wish Santa a Merry Christmas as Mary Christmas hands baby Christmas to Santa. All of a sudden there is a flash of lightening (Cue evil type music) and the evil Baron (Paul) appears, picks up Mary Christmas and throws her over his shoulder and takes off with her. Baby Christmas starts to cry as total bedlam ensues in the grotto. All the nursery folk run around as bit of the grotto fall in. Madge says that they should call a doctor, Clive sits up and says he is a doctor and asks who won the fight. Helen tells him that it hasn't started yet and Clive replies aren't they wasting time. Dan encourages Shane to get on with it, but Jane suggests that they end it now. Mike says that Clive could have got hurt pretty badly and he will if Shane will. Dan tells Shane “You aren't going to let him off the hook. But Shane tells him to stay out of it, Mike is right it could have been a nasty accident. 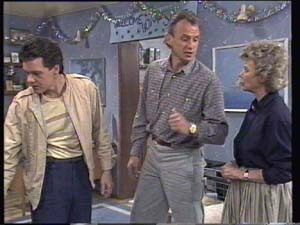 It is a lousy way to start Christmas and he gets up and holds out his hand and Mike and Shane shake hands. Clive invites everyone back to his house for a glass of Christmas sprits. Madge and Helen apologise and they wander off discussing Christmas cake and mince pies to take to Clive's. 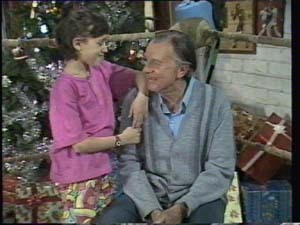 Susan tells Clive that he will have to tell her what he wants for Christmas as she is terrible with presents; he replies a pair of socks …and Mary Christmas. Susan giggles and says it is a bit early. Clive tells her it is never too early. Lucy wanders over to Dan who is sitting in one of the ring corners looking down hearted. Lucy says “No hard feelings Mr Ramsay. Dan laughs and says ”Fair and Square Lucy… no hard feelings” They go off hand in hand as a band plays “Oh come all Ye faithful” and you see a Christmas tree full of presents….